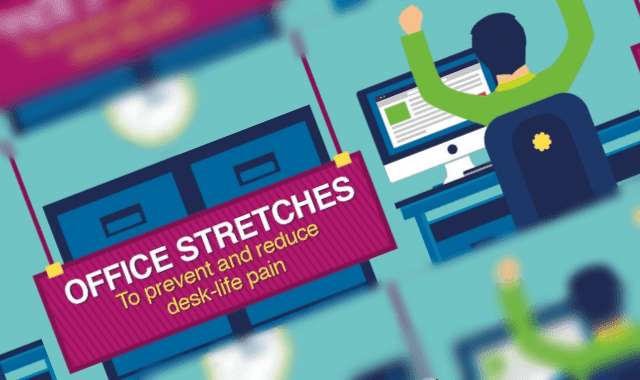 Office Stretches To Prevent And Reduce Desk-Life Pain #Infographic ~ Visualistan '+g+"
Hours and hours of sitting in front of a computer can leave you with painful, achy muscles. Even for workers who alternate between sitting and trying to implement a variety of different standing workstations, pain can creep up by the end of the day. Taking the time to stretch your shoulders, wrists, fingers, back, neck, and legs periodically throughout the day can cut down on long-term work-related muscle soreness and stiffness. Take a look at the illustrated stretches below to learn our go-to desk stretches.